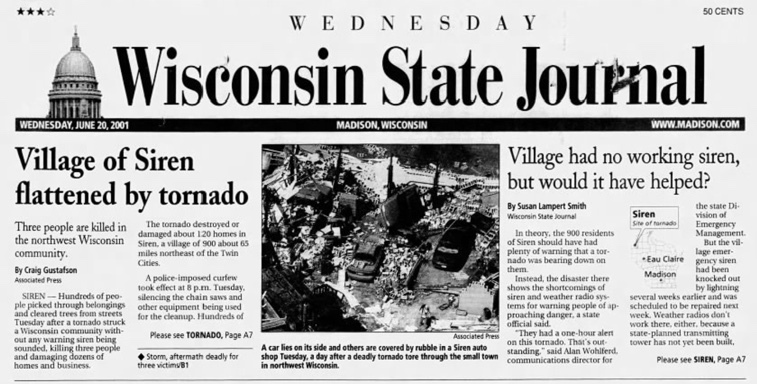 On the morning of Monday, June 18, 2001, it was evident that severe weather would occur over the Upper Mississippi Valley. The Day One Convective Outlook issued early that morning from the Storm Prediction Center showed a large moderate risk area over Minnesota and Wisconsin. A warm front lay across Minnesota and Wisconsin with a moderately unstable airmass to the south of the boundary. A strong upper-level disturbance was approaching from the west. Tornado watches went up by early afternoon. Siren Police Chief Dean Roland was concerned. He knew that the town’s warning siren was out of commission. It had been struck by lightning a month before and was scheduled to be repaired the very next week. A new NOAA Weather Radio transmitter was ready to be installed, but the tower had not yet been built by the state. Convection finally began to fire about 6 o’clock over eastern Minnesota near St. Cloud. The southernmost thunderstorm grew into a powerful supercell storm as it approached the Wisconsin border. The National Weather Service in Duluth, Minnesota issued a tornado warning at 7:35 p.m. as the storm exploded on radar. Police Chief Roland went into action, driving around the town and announcing the warning over his cruiser’s loudspeaker. At 8:06 p.m., a tornado snaked down from the powerful storm near Grantsburg, Wisconsin, about 14 miles west of Siren. About 8:20 p.m., Roland stopped his police car on the west end of Siren and tried to make sense of clouds converging from two directions. Suddenly, a huge white funnel burst on the scene and heavy winds began buffeting his car. He watched helplessly as the tornado headed straight for the middle of this town. The F3 tornado damaged nearly every building and house in the town of 1,000 people. A total of three people were killed and 16 were injured along the storm’s 27-mile path. An important lesson from the Siren storm: sirens should not be depended upon for receiving warnings. Everyone should determine what is the best source of weather information for them to monitor during potentially severe weather: NOAA WeatherRadio, apps like MyWARN or the WeatherRadio app by WDT, commercial radio or television, etc.